1 of 2 Let piecrust stand at room temperature 15 minutes. 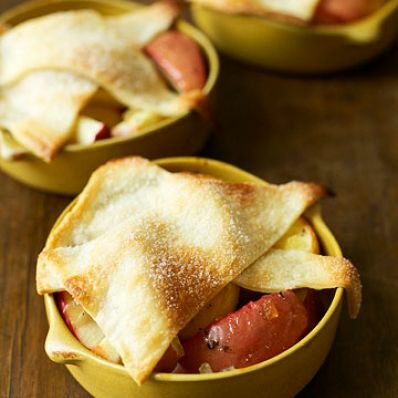 Heat oven to 400 degrees F. Arrange apple quarters in six 6-ounce custard cups. In a small bowl, stir together lemon juice, honey and ginger. Drizzle over apples. Sprinkle lightly with coarsely ground pepper; set aside. 2 of 2 Unroll piecrust. Brush lightly with milk. Sprinkle sugar evenly over piecrust. Cut into 12 wedges. Drape 2 pastry wedges over apples in each cup, allowing corners to hang over edge of cup. Place cups in a 15 x 10 x 1-inch baking pan. Bake for 20 minutes or until crust is golden brown. Serve warm with whipped cream, if desired. Per Serving: 5 g fiber, 135 mg sodium, 1 g pro., 51 g carb., 285 kcal cal., 4 g sat. fat, 10 g Fat, total, 7 mg chol.